Surely this will satisfy your need for USB ports? Running out of USB ports for your peripherals is annoying, and daisy-chaining powered four-port hubs is messy and a waste of plug sockets. 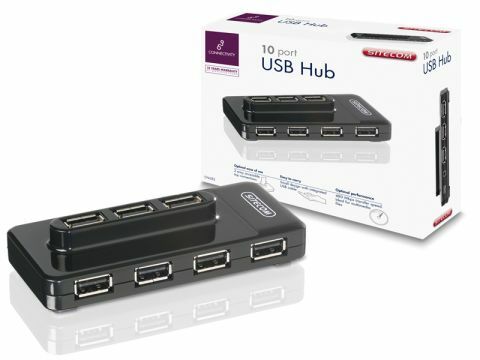 A ten-port USB hub, like this one from Sitecom, is much more elegant. With four ports on the front, three at the rear and three on top, it sits well on your desk. You can slot permanently connected peripherals in the not-so-easily-accessible ports, and save the top-mounted ones for regularly removed devices. You need never be short of USB ports again!